Good morning! I’m sitting in the doctor’s office typing this (yesterday morning, check me out getting a day ahead! ), doing a three-hour-long glucose test because I stupidly had carbs the morning of my glucose test last week and got sent to the principal’s office for the long test. Bad Sarah. Anyway, did your jaw hit the floor when you saw my dark colors and neutrals? 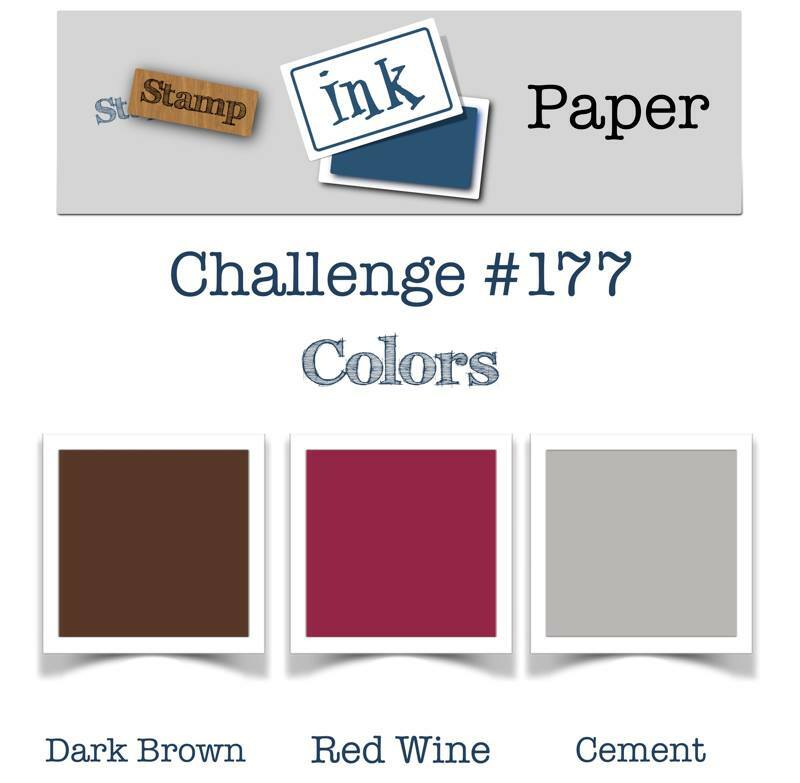 These colors are not usually my thing, which can only mean one thing — we have a color challenge over at Stamp, Ink, Paper today! Red Wine, Cement, and Dark Brown. I am using Merry Merlot, Gray Granite, and Early Espresso. We’d love for you to play along with the challenge this week, so please head over to the challenge blog! 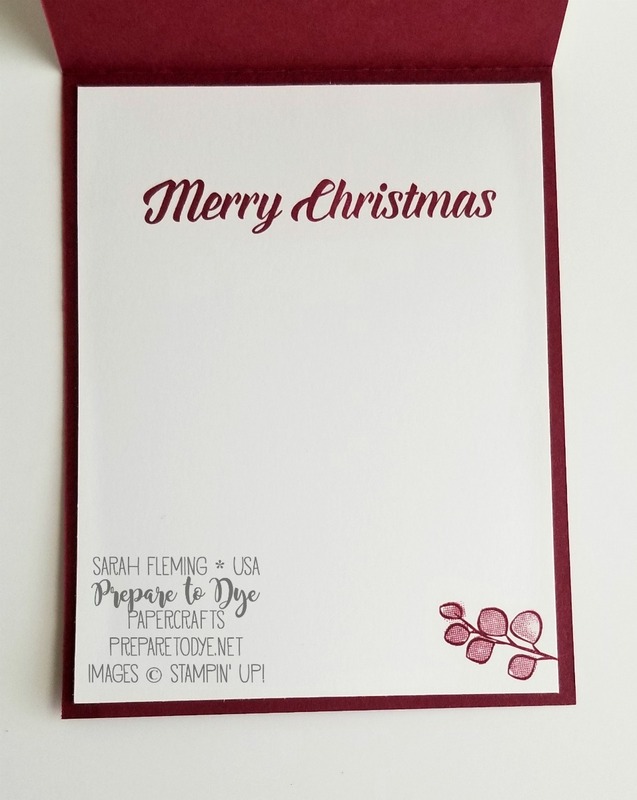 My card base is Merry Merlot, 4-1/4″ x 11″, scored at 5-1/2″. My stamped layer is Whisper White cardstock, 4″ x 5-1/4″. I first stamped the images down the left side of the card in Gray Granite. This is a solid-ish stamp meant for layering, so I stamped the one at the top and the one at the bottom of the card full-strength and all the rest are stamped off once. Then I stamped the detailed layer full-strength in the same color. Then I stamped the outline of the berries in Merry Merlot and the inside of the berries in Merry Merlot. As you can see, the top two sets of berries and the bottom two sets of berries are stamped off once, and the others are stamped full-strength. 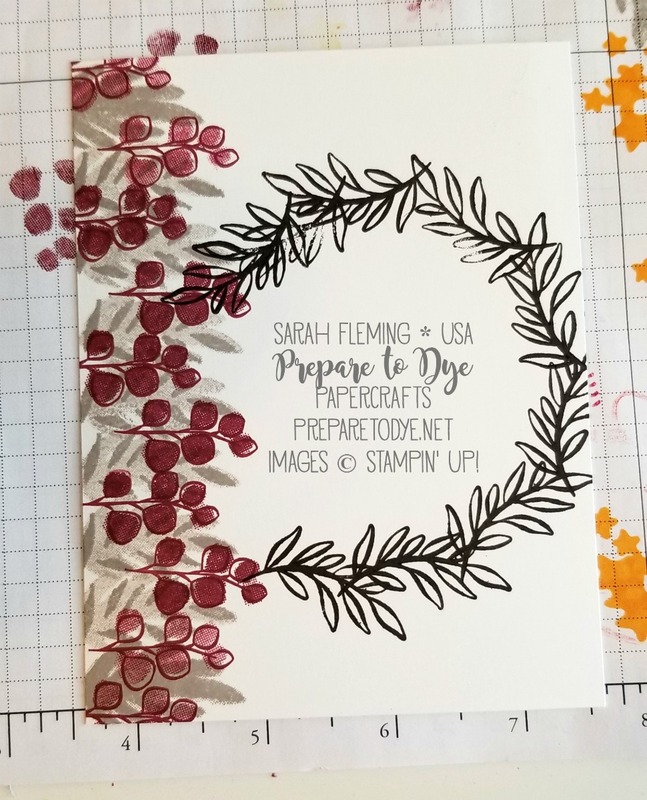 I had planned to just have the stamped sentiment and the layering circles behind it, but when I laid out the card, it needed a little something, so I decided to stamp a wreath. You can use the Stamparatus and make templates to do perfect wreaths, but I didn’t want to spend the time making templates (because I haven’t made them yet), so I took the biggest layering circle that would go on the card (the scalloped circle), laid it down on the card, and positioned my stamp (and by positioned my stamp, I mean it was mounted and inked up with Early Espresso already, and I hovered my hand over the edge of the circle), then removed the circle and stamped. I did this repeatedly, all the way around the circle. 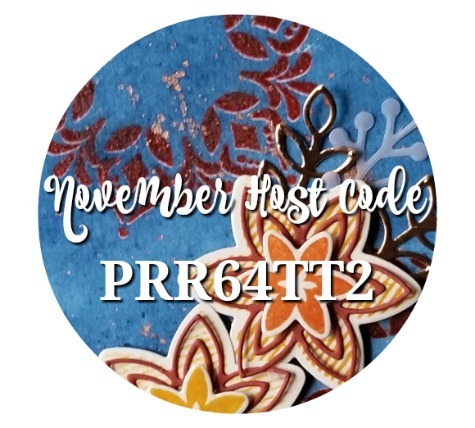 So if you don’t want to stop to make templates (which, of course, you only do once and then can use over and over) and are short on time, this is an easy, low-tech way to stamp your wreath. After the wreath was stamped, I decided to heat emboss some little copper berries around the wreath. Then look at that amazing ribbon! 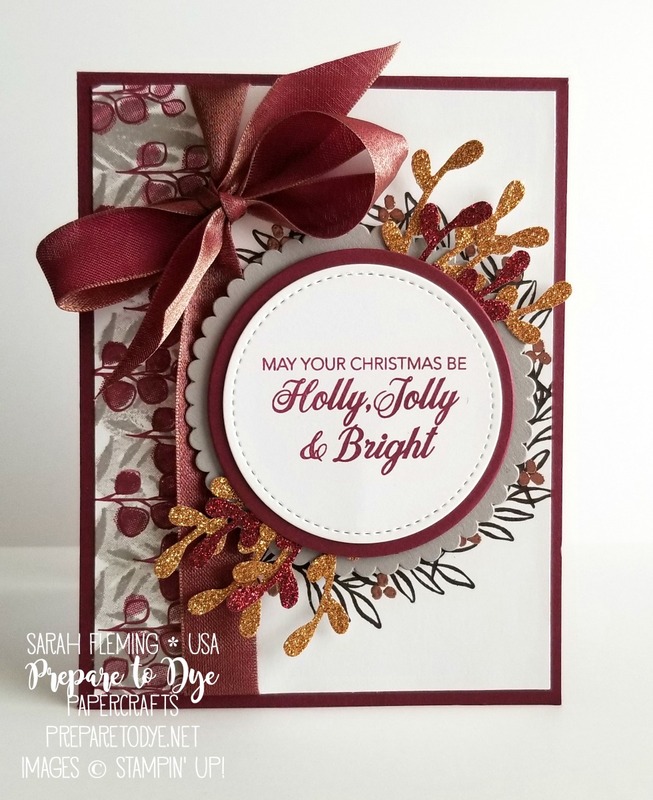 It’s Merry Merlot & Copper 5/8″ Reversible Ribbon, and it is even more stunning in person. I wrapped it around the card and tied the bow, then added the sentiment and the layers behind it. The bottom layer is Gray Granite cardstock cut with a large Layering Circles die cut. 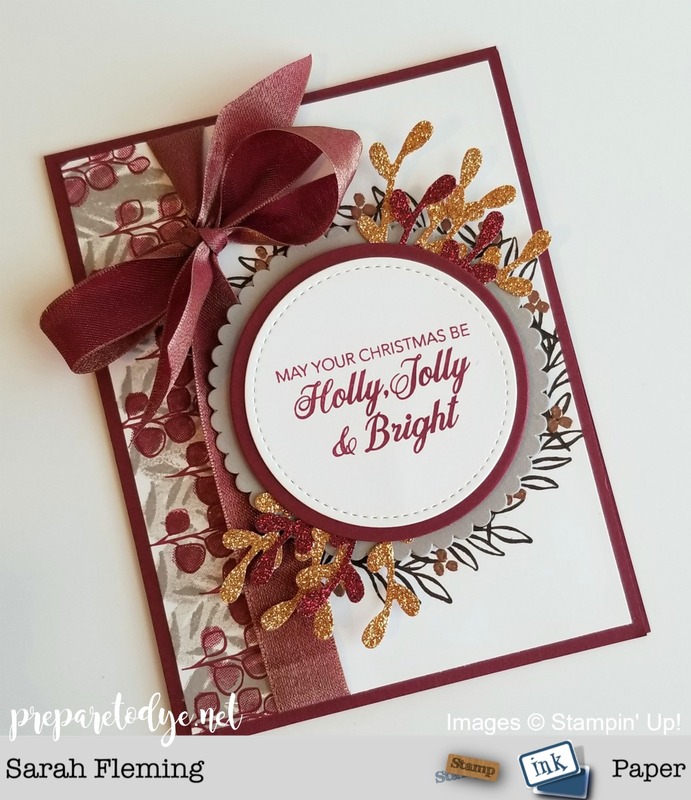 On top of that, I added some sprigs cut out of Joyous Noel Glimmer Paper (copper and Merry Merlot used here, it also has Tranquil Tide). I topped those with a Merry Merlot layering circle, then a Whisper White Stitched Shapes circle with my sentiment (from Peaceful Noel) stamped in Merry Merlot. 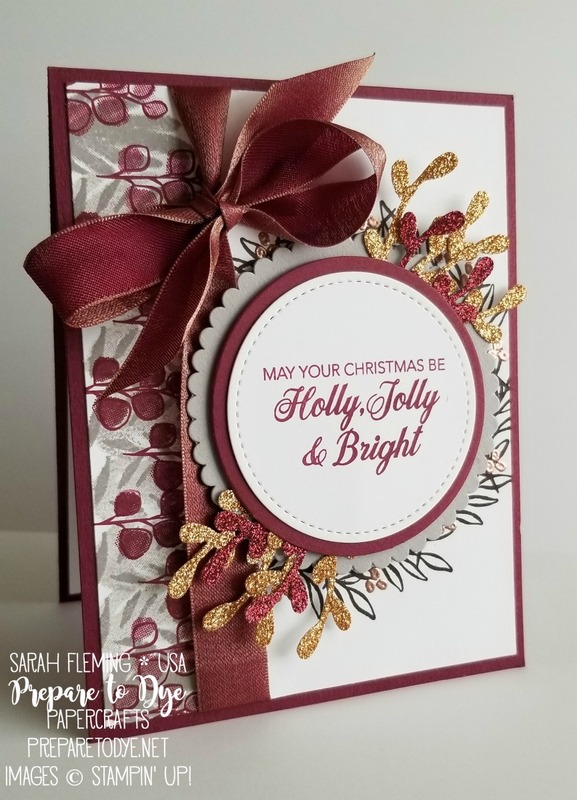 Inside I stamped the Merry Christmas from Timeless Tidings and some more berries.